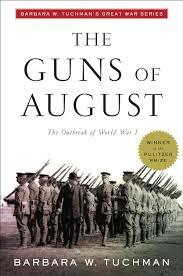 August, 2014 marked the 100th Anniversary of the First World War , the perfect stimulus to read or reread Barbara Tuchman’s The Guns of August. While the French high command argued over whether to eliminate the crimson of their soldiers trousers, the Germans had already converted to olive-green and were building a mighty force and a thirty-six day offensive plan to bring France to a quick and tidy surrender and to regain German losses to both Russia and France from the war of 1870. Barbara Tuchman in her Pulitzer Prize winning The Guns of August uncovers in great detail the misguided decisions and confusion among the French, German and British military and civilian leadership that led to the disastrous four years of carnage following the August 1914 outbreak of the First World War. Tuchman leaves no stone unturned in the chronological detail leading up to the outbreak of the war. and its raging first month of battle. The Guns of August carries the reader through the German invasion of Belgium to the standoff on the outskirts of Paris and the Marne as the German Army, by only inches, missed its opportunity to complete their 36 day plan for certain victory over France. The French Army by mid-August had been in retreat since defeat at the Battle of the Frontiers on the Belgium border. The Germans army brutally pushed through Belgium, slaughtering civilians in their wake and then moved almost at will into Northern France capturing not only territory but the rich natural resources that would help fuel its stamina through what would become four years of trench warfare. Meanwhile the British remained reluctant and confused in their commitment to both Belgium and France. So much for French ” Élan” as their armies retreated in a desperate attempt to regroup before Paris fell. The Guns of August sets the stage for what became The Western Front, four years ( 1914-1918) of the most horrendous fighting in the history of the modern world. Casualties at one point reached 50,000 per day. Tuchman’s narrative style allows for assimilation of a trove of information and detail of an event the enormity of which forever changed the world. Tuchman retains a rightful honored place among the great historians of her time. The Guns of August was published in 1962. She won a second Pulitzer in 1971 for ‘Stilwell and the American Experience in China, 1911-45. Also by Barbara Tuchman, The Proud Tower, a look at the quarter century leading up to World War I, the clash between Olympian luxury of the wealthy and the uprising of the underclass. Additionally, The Zimmermann Telegram, the story of the German promises made to Mexico to entice them to enter the First World War. Her last book The First Salute, published in 1988, sets the American Revolution in international perspective and was on the New York Times best-seller list for 17 weeks. Barbara Tuchman died in 1989 at age 77 after suffering a stroke at her home in Cos Cob, Connecticut. The cabin in which she wrote her prized works remains on a rocky rise overlooking the meadows of the family property. This entry was posted in Non-Fiction and tagged 20th Century Historians, August 1914, Barbara Tuchman, Stilwell and the American experience in China 1911-1945, The First Salute, The Guns of August, The Proud Tower, The Zimmermann Telegram, World War 1. Bookmark the permalink. ← David McCullough- Thirty Seven Years Later- A NYT Best Seller !